Fluid Sealing International (FSI) designs and manufactures a range of mechanical sealing products for the diverse applications encountered in the oil and gas industry. These products are in accordance with API Standard 682 for shaft sealing systems. Equipment selection and operation in hydrocarbon processing plants is based on reliability, personnel safety, and environmental impact. For these reasons, properly designed mechanical sealing systems are of primary importance. FSI has specialized products to meet these requirements. The products handled in oil and petrochemical processing range from viscous refinery bottoms to liquefied petroleum gases (L.P.G.) to flammable gases. 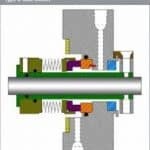 Careful consideration must be taken when selecting pumps and mechanical seals for these products. 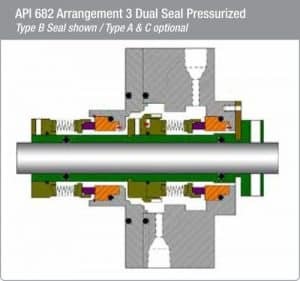 Temperature ranges of sub zero to 800F, low specific gravity hydrocarbons, products handled near their vapor pressure, and flammable liquids all present unique challenges for proper mechanical seal selection as well as dependability. FSI offers a range of single, double, and tandem heavy duty cartridge seals designed and engineered to accommodate the various centrifugal pumps built to API 610 standards, as well as specialty pumps encountered in the oil and gas industry. Mechanical seals manufactured by FSI include balanced rotating flexible element pusher seals, stationary flexible element pusher seals, rotating and stationary metal bellows seals, and stationary and rotating high temperature metal bellows seals. 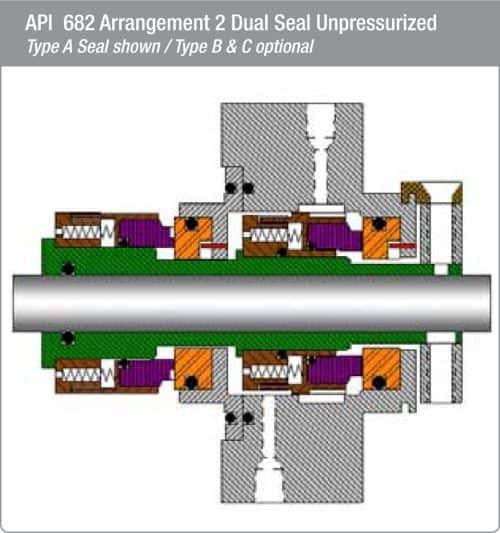 All cartridge seal assemblies are pressure tested per the API 682 guidelines and test criteria. 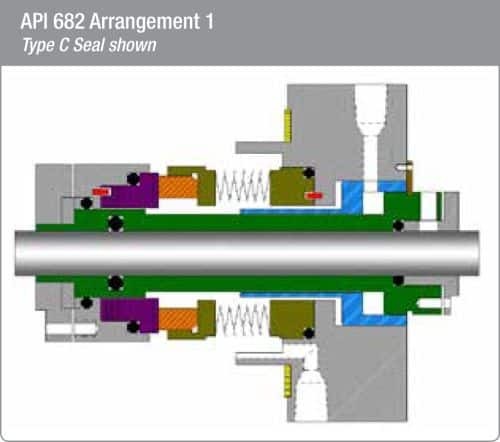 Shaft sealing systems as designated in API-682 are defined by three primary seal types and arrangements. Included in these seal types are the recommended flush plans for each arrangement. Rotating flexible element as the standard configuration. Stationary flexible element is optional and must be called out on the data sheet. Standard flush is single point, and standard restriction bushing is fixed design. Optional multi-port flush as well as floating or segmented bushings are supplied based on application requirements. 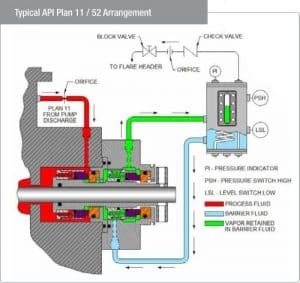 A pumping ring is also available when seal is designed for API Plan 23 operation. Low temperature rotating metal bellows element as the standard configuration. Stationary metal bellows is available as an option and must be called out on the data sheet. The porting and bushing standards and options are the same as the Type A seal. 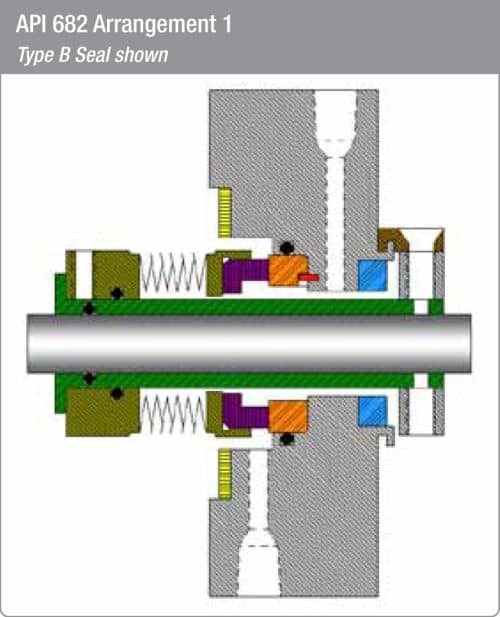 High temperature stationary metal bellows element as the standard configuration. Rotating bellows are optional and must be called out on the data sheet. In addition to the porting and bushing options for Type A/B seals, the Type C seal can be supplied with a steam purge bushing for more efficient steam quench in coking applications. These seals are for use in either un-pressurized (Arrangement 2 / API Plan 52) or pressurized (Arrangement 3 / API Plan 53) services. Both the pusher type seal and metal bellows seal utilize rotating flexible elements. Both arrangements also incorporate a pumping ring for forced circulation of barrier fluid for cooling of the outboard seal. Inboard seal cooling is accomplished with a seal flush. The inboard seals for pressurized operation must have an internal (reverse) balance feature to maintain face contact in the event of barrier fluid pressure loss. All of the above pertains to wet contacting mechanical seals as they apply to API general purpose applications and services. Plan 11 takes re-circulation from pump discharge to seal chamber at seal faces, flushes faces and flows across the seal back into the pump. 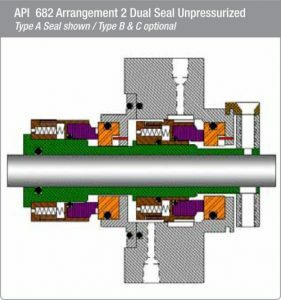 Plan 52 is an external reservoir providing buffer fluid for the outer seal in an un-pressurized dual seal arrangement. During normal operation, circulation is maintained by an internal pumping ring. The reservoir is continuously vented to a vapor recovery system or flare, and is maintained at a pressure lower than the pressure in the seal chamber.